US Defence Secretary Jim Mattis and Secretary of State Mike Pompeo are visiting India to hold strategic talks on military and trade deals. The BBC's Vikas Pandey explains what's at stake. The meetings between the US officials and their counterparts Nirmala Sitharaman and Sushma Swaraj - described as the 2+2 dialogue - are taking place against a backdrop of recent strains between Washington and Delhi. Meetings were first scheduled in April, but had to be rescheduled after US President Donald Trump fired his then Secretary of State Rex Tillerson. The dialogue was suspended once again in July for what India's foreign ministry described as "unavoidable reasons". Mr Trump's reported mocking of Indian Prime Minister Narendra Modi's accent hasn't gone down well with Indian diplomats. And the unpredictable nature of the Trump administration has also made India's diplomats cautious. Washington and Delhi mostly enjoyed warm relations during former US presidents George Bush and Barack Obama's stints at the White House. But it's too soon to say the same about the Trump administration. Pratyush Rao, associate director for India and South Asia at Control Risks consultancy, said India needs to adopt "cautious optimism" in the talks. "For India, which won a number of special favours under the Bush and Obama administrations - notably the civil nuclear deal and waivers on its oil trade with Iran - the real challenge will be how it now copes with the highly transactional nature of the Trump presidency," he told the BBC. It's true that Mr Modi invested a lot of time and energy in India-US ties. He has said on many occasions that Mr Obama was his friend, and he liked working with him. The new US administration has shown that it can take unpredictable decisions - like Mr Trump's summit with North Korea's leader or deciding to walk out from the 2015 Paris climate agreement, and withdraw from a nuclear agreement with Iran. "Indian diplomats will have these surprising decisions in mind when they negotiate deals with the US," Mr Rao says. India - which makes very few of its own weapons - is the world's biggest defence buyer, and Russia supplies most of its military equipment and spare parts. In comparison, Russia's share has fallen from 79% to 62% over the past five years, according to a study by the Stockholm International Peace Research Institute. "The US has long believed that India needs to be strong militarily to counter China in the region - even if it comes at the cost of Delhi buying arms from Russia," says Mr Rao. 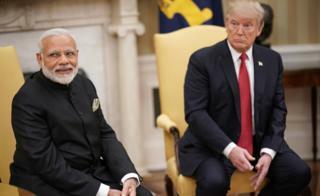 "I can't sit here and tell you that they [India] would be exempt, that we would use that waiver - that will be the decision of the president if he is faced with a major new platform and capability that India has acquired from Russia," Randall Schriver, assistant secretary of defence for Asian and Pacific security affairs, said. It's not surprising that the deal is likely to be top of the agenda on Thursday. Image caption Mike Pompeo has called India the US's "only major defence partner"
"The two countries will take a hard stand on the issue. However, they have no other option but to find a solution. There is some confusion on different issues between the two countries, but there is no mistrust," she said. The US has also said that it was against India buying crude oil from Iran. But Delhi may find it difficult to agree to the demand, something Ms Banerjee says India "cannot afford". India has pledged to invest more than $500m (£390m) to develop a port in Iran's Chabahar city. The port will give India access to central Asian countries to boost trade. "Iran is an important strategic partner for India. Stopping oil imports will upset Tehran. However, India may agree to cut down on the amount it imports," she said. But that will largely depend on how the US sees India's position. "Whether or not the US would be willing to insulate India from sanctions and other headwinds has potential consequences for how bilateral relations shape up over the next few years, including in the Indo-Pacific," Mr Rao says. "But India has always been cautious about direct talks with the Taliban. Since it's one of the biggest aid donors to Afghanistan, Delhi would want to have a say in how the peace process unfolds in the country. And it may not feel at ease if the US holds talks with some groups that Delhi believes are backed by Pakistan," she said. Are trade issues spoiling the Trump-Modi bromance?